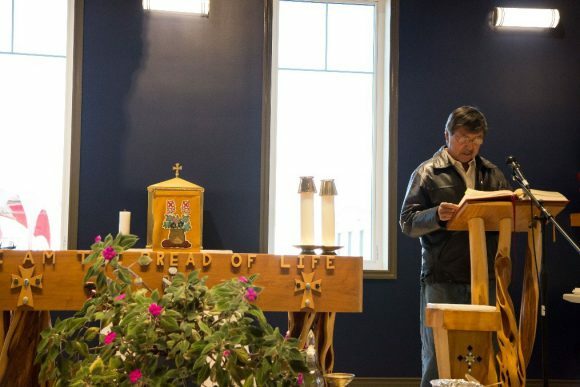 Sept. 17, 2017 concluded the long journey towards achieving the building of the new church in Fort Simpson. The project featured many years of fundraising and planning, and included supporters from within and outside the Diocese. 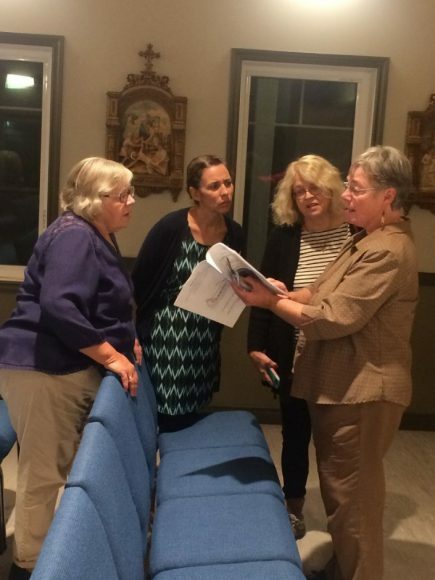 The Building Committee for the Project included members from both the Sacred Heart Parish and the Diocese: Fr. Joe Daley, Gerri Fletcher, Martina Norwegian, Darlene Sibbeston, Didier Bourgois, Gordon Van Tighem. The concept design was done by Denis Brunea Architecture, who also assisted the Building Committee throughout the project. 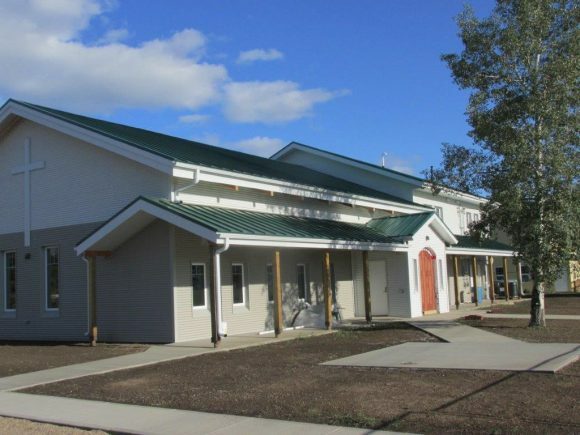 The builder and general project manager was Rowe’s Construction, a Fort-Simpson based construction company. The Building nearly complete, with sidewalks and bell-tower pad for future installation of the former bell. The installation of the cross over the main church door the day before the blessings ceremony. For many community members, this marked the time when the building looked and felt like ‘a church’. Gathering of guests at “Bannock-Land” the evening before the blessing, to recall the history and experience of the visit of Saint John Paul II to Fort Simpson in September 1987. 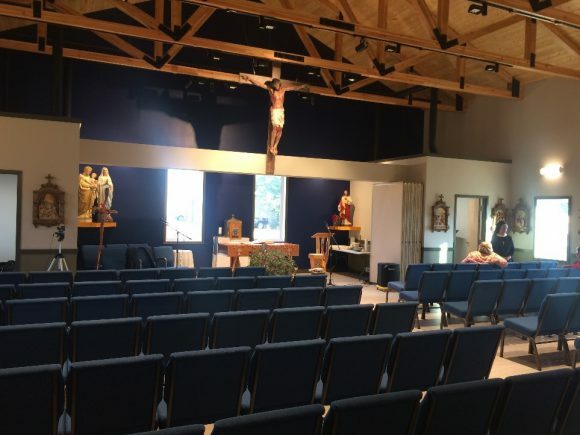 The Building is made ready for the blessings ceremony, with the arrangement of the sanctuary, and the set up of the “church chairs”. Practicing the music for the Blessing Liturgy. 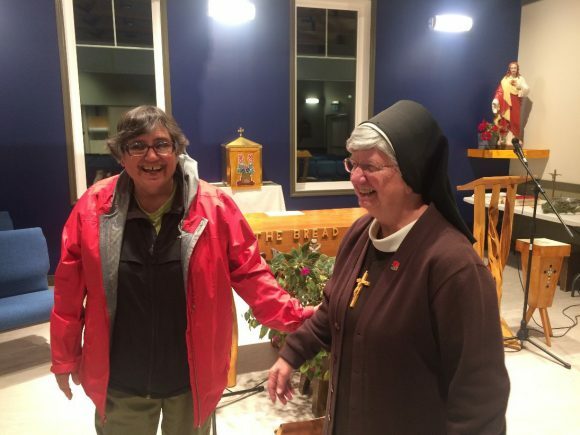 Sisters Dian Naud and Mary Lee Prezbylski share a laugh as they assist the preparations the evening before. 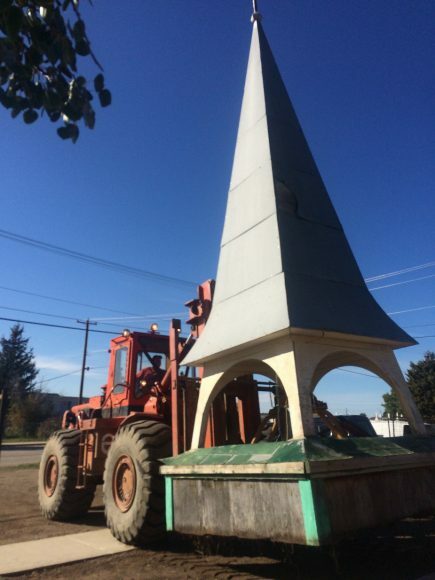 Rowes Construction moves the original bell tower onto the site before the installation. 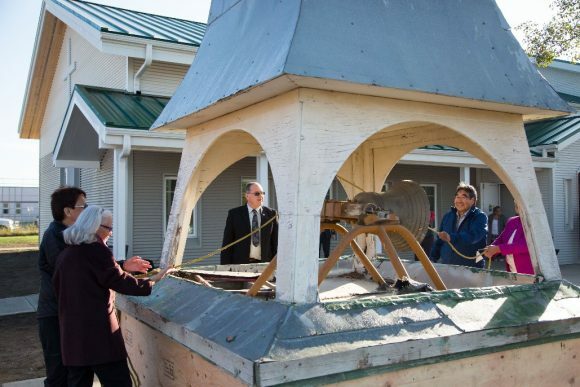 The bell tower will be permanently installed at a later date, when a proper support structure can be constructed. 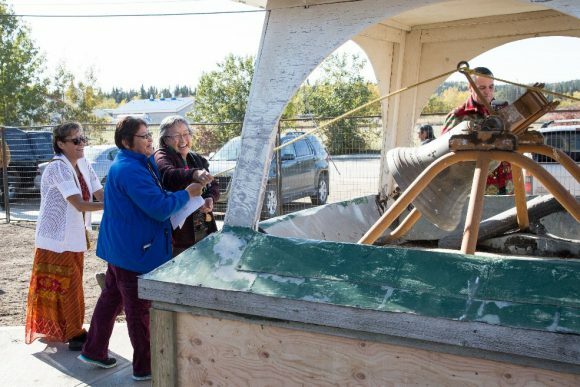 Various Decho community members take turns at ringing the bell prior to the ceremony. 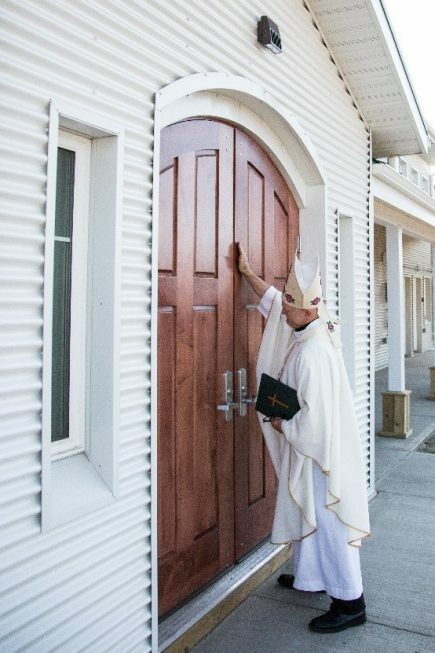 The ceremony begins with Bishop Mark Hagemoen knocking at the new door of the Church. 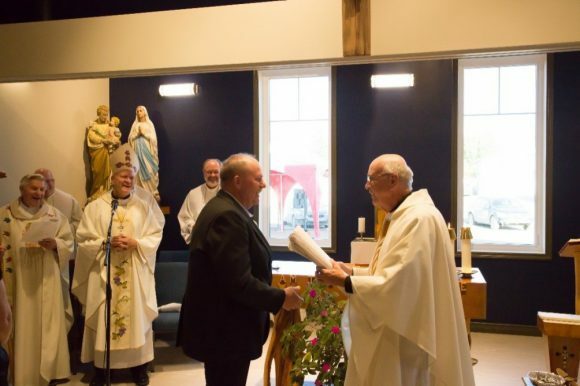 Owen Rowe of Rowes Construction passes on the plans and the keys to he new building to Pastor, Father Joseph Daley. 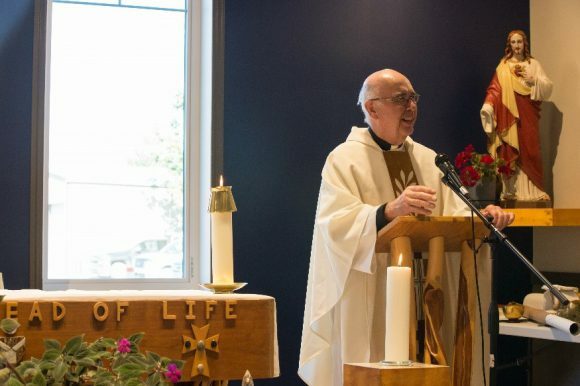 Emeritus Bishop Denis Croteau, OMI, was also present for the ceremony. 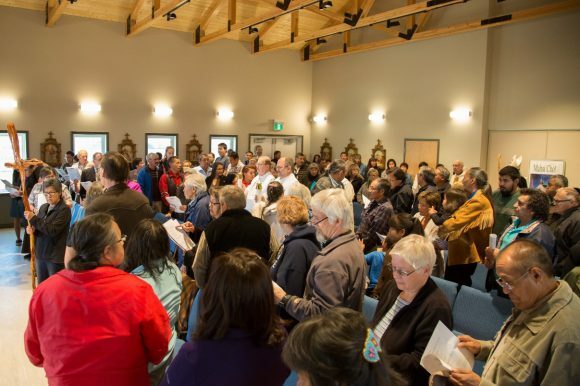 The community gathered for the ceremony in the new Church. 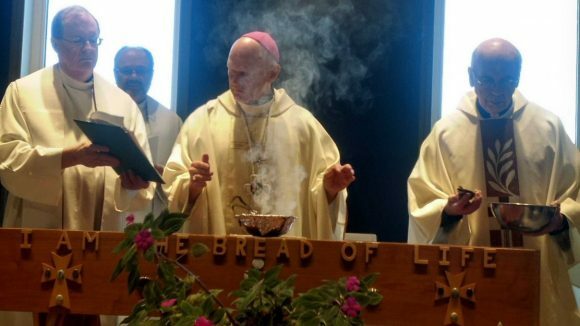 The Church, Altar, and Ambo are incensed and anointed with Chrism Oil. Bishop Hagemoen and Fr. 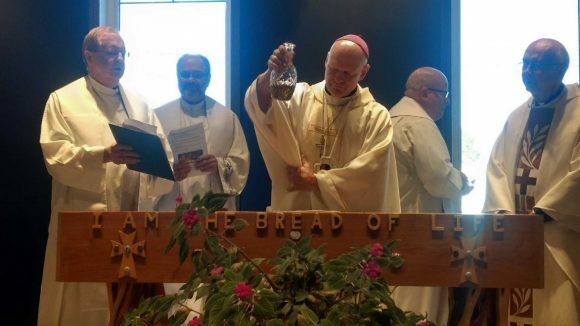 Daley are assisted by other priests representing other supporters of the Church project: Father David Rylander of Catholic Mission in Canada; and Fathers Murry Kroetsch and David Wynen of the Diocese of Hamilton. Father Daley express thanks and enthusiasm during the blessing ceremony. Fr. 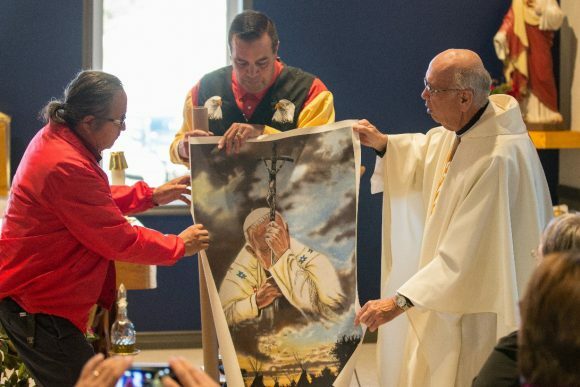 Daley and Chief Gerald Antoine receive the gift from Gary Gagon of the Archdiocese of Edmonton: a painting of St. Pope John Paul II at the Eh Dah site, where the Pope greeted and celebrated Mass with the community in 1987. 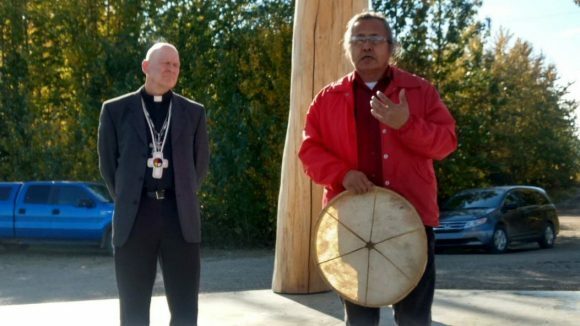 Chief Gerald Antoine and Bishop Mark Hagemoen at the prayer ceremony held at the Eh Dah site the afternoon following the Church blessing and reception at the Community Center. 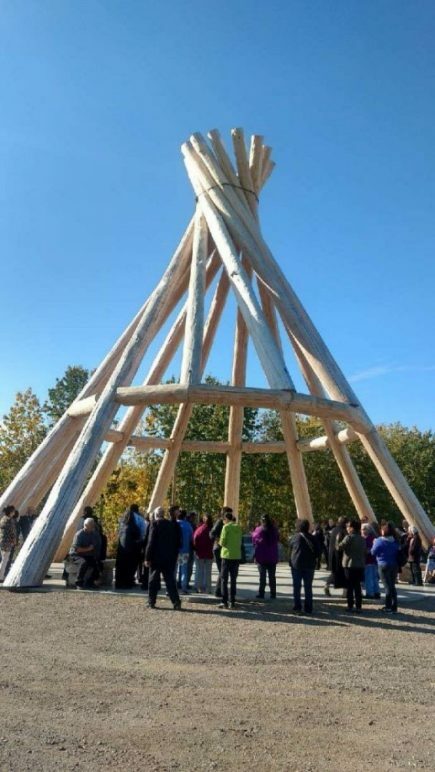 The new yellow cedar log tepee was installed on the site in 2016, because of serious deterioration of the former tepee and altar constructed in 1984. 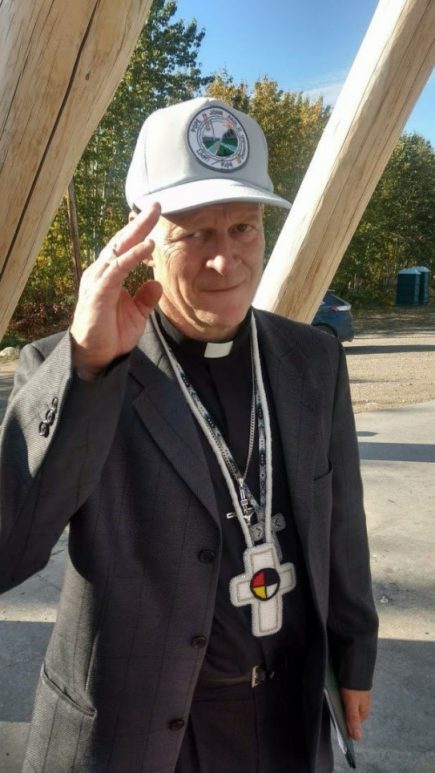 Bishop Mark wears a ‘papal hat’ made for the 1987 event, presented at the prayer service. A view of the Mackenzie River from the site.